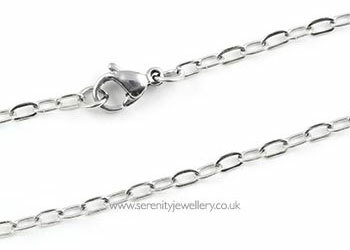 18" and 24" surgical steel necklace chains with 9mm lobster claw clasp. I love it, nice and useful. Quick delivery. I would love a longer one. Was worrying it would be too long, but literally u can adjust to whatever length u want by clipping on different parts of it! Great!! Hope it won't tarnish soon! Great necklace - easy on the skin, and very versatile. I wear it with different pendants. Good value for the price. LIke the fact that unlike silver chains this doesn't tarnish. It is very reflective but at the same time looks very robust and very attractive with different pendants attached. Good value for money. Would like to see this in a 16" version.